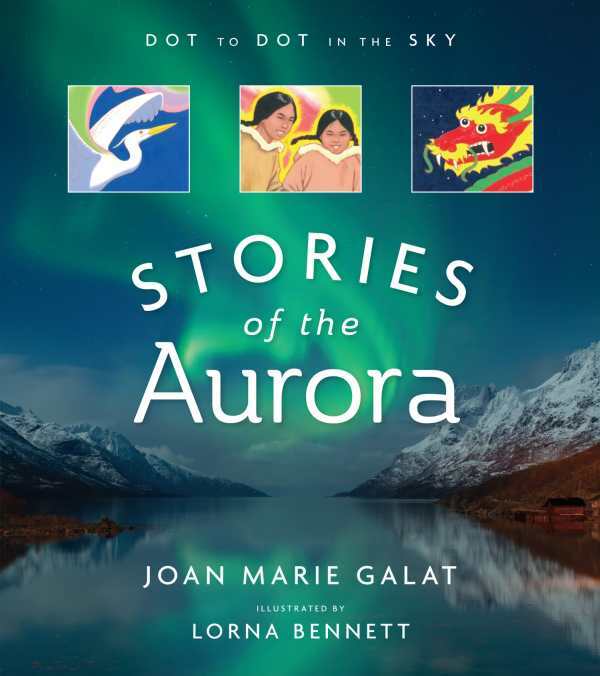 “High in the sky, green, white, red, and purple ribbons of light flicker and wave, as if dancing to the sounds of a celestial choir.” That lyrical description of the aurora opens Joan Marie Galat’s Stories of the Aurora, the sixth title in her Dot to Dot in the Sky astronomy series. These educational books are original blends of fact and fiction, science and stories. Auroras have been known by a myriad of evocative names throughout history and across cultures, like the “Buddha Lights” in Ceylon and the “Dancing Goats” in France. Most visible near the North and South Poles in the spring and fall at sites sufficiently far from city lights, the aurora occurs when particles from the Sun enter Earth’s magnetic field and collide with gas in the atmosphere. Diagrams and color photographs make the book’s information appealing and accessible, and pull boxes share some amazing trivia. World folklore is rife with stories of how the aurora originated and what it means. Galat gives a thorough survey of different peoples’ beliefs about signs in the sky. For instance, in Greenland the lights were interpreted as a communication from the dead, perhaps from children who died at birth. The Alaskan Inuit saw auroras as the spirits of hunted animals, while in Denmark they were imagined to be flocks of geese trapped in the ice. The aurora has also been associated with omens, whether good or bad. The Chinese consider it a benevolent sign protecting childbirth, but on the day of the Pearl Harbor bombing, one was seen as far south as Cleveland, Ohio—a visible portent of war. This beautiful book, enhanced by Lorna Bennett’s illustrations, holds two ideas in perfect tension: the aurora is a comprehensible scientific phenomenon yet remains a mysterious force that provokes universal wonder.